Each year we grow 15 acres of organic vegetables for our shareholders in NYC. Our goal is to offer the widest possible assortment of vegetables. Each week, for about 22 weeks beginning in mid-June, we'll have salad greens and cooking greens, herbs, an assortment of roots, bulbs and tubers, and seasonal vegetables, including tomatoes, squashes, cucumbers, peppers, melons, and eggplant. We'll have peas in the spring, beans in the summer, and sweet corn every other week from mid-July to mid-September. And we'll have a wide variety of unusual vegetables that may come in small quantities, but that truly enhance our eating pleasure. Our goal is to meet the seasonal vegetable needs of a family of two adults and two children or two enthusiastic vegetable eaters. Results from surveys of our shareholders tell us that our quantities have been good ("not too much, no too little") and that the share has been a good value. We offer one size of vegetable share and it sells for $488. Vegetable Share Members can also add a Fruit or Flower Share. An egg share is also available to members. JUNE... Lettuces, succulent salad greens, 'Mei Qing' choi, 'Oregon Giant' snow peas, French breakfast radishes, white Japanese turnips, fresh scallions, potted Mediterranean herbs for your windowsill, and, with some luck, a harvest of spring broccoli. This is salad month, a fresh start to the harvest year. JULY... Spring spinach and greens give way to baby beets, bunched carrots, crisp cucumbers, and, by mid-month, squashes, green beans, and basil. By late July, we'll have green onions, sweet corn, and, with good weather, 'Juliet' and 'Mt. Spring' tomatoes from our covered field houses. AUGUST... The dog days... sweet bell peppers, eggplants, zucchinis, red and green onions, and new potatoes. Dripping, sliced tomatoes, and mouth-watering melons. All these, along with lettuce mixes, carrots, more green beans, and herbs. SEPTEMBER... Cool nights invite the return of greens and broccoli, while warm days keep the summer vegetables happy. Garden salads and simple steamed vegetables adorn your table. OCTOBER... Frost ends the summer vegetables, but improves the flavor of those left behind. Crunchy carrots, perhaps some cauliflower, the makings for a pot of potato-leek soup, shell beans, steaming winter squash, and pie pumpkins. NOVEMBER... The season ends with cold-loving kale and other hardy greens, salad greens from the field houses, dry beans, carrots, leeks, celery root, potatoes, and cabbage. Hearty stews and roasted root vegetables help us prepare for the coming of winter. During a part of every season, we use a free-choice distribution format. We know that individual preferences vary, and so we try to offer as many choices as possible. 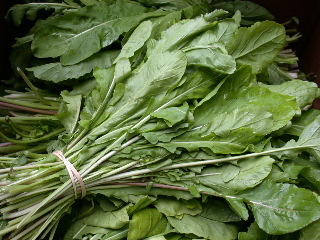 For example, we might bring three or four kinds of greens, and let you decide which to take home and which to leave. If you don't like kale, leave it for someone who does, and take more lettuce or Swiss chard instead. We'll also place roots, bulbs and tubers together, specify the weight you may take, and let you decide how many pounds of any one item to take. If you like, you may take an assortment of items (e.g., carrots, potatoes and onions), but you're also free to take a larger quantity of just one item (e.g., just onions). Past shareholders have told us they are most happy when they've had the most freedom to choose, and so we'll offer as many choices during the year as we can.